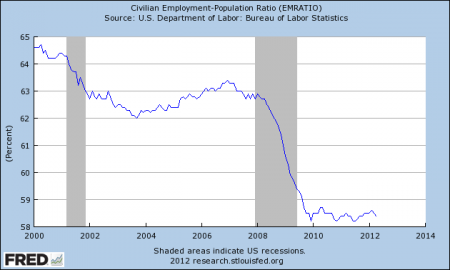 Official unemployment rate has gone down dramatically, but the improvement of labor market has been largely fake, as the employment-population ratio hasn’t moved much since recession ended. 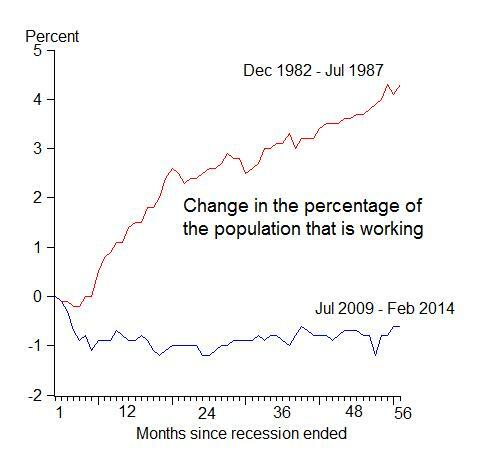 See this sharp chart from John Taylor at Stanford. Feel puzzled? You can find out the reason why unemployment rate and the employment-population ratio tend to diverge during this reovery here. So what to believe? 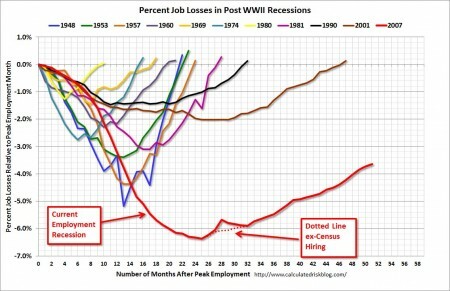 Is US labor market thawing? Or are we still in a slump? 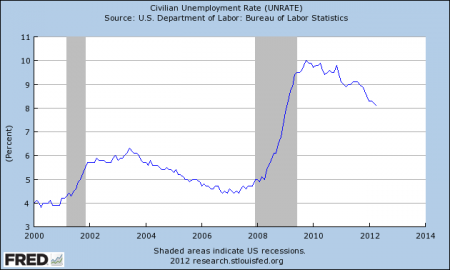 The official unemployment rate is calculated as the number of unemployed divided by labor force. Let’s use an example to illustrate. An economy has a total labor force of 100; if 10 is unemployed, then the unemployment rate is 10/100=10%. 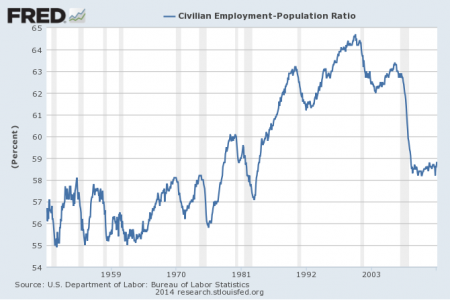 To understand the issue, we need to appreciate how the labor force is calculated. If 3 out of 10 people who are previously unemployed drop out of labor force, because they are discouraged by not being able to find a job for quite some time, labor force now changes from 100 to 97. 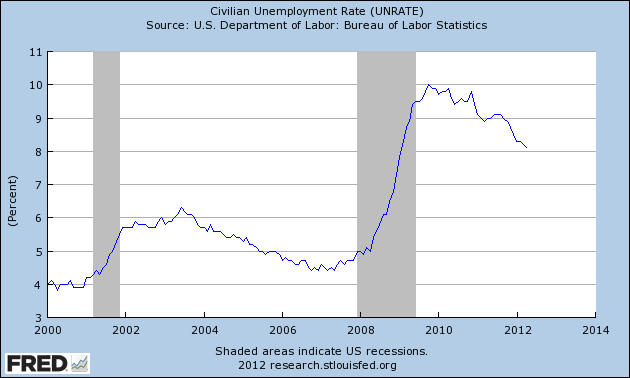 And the new unemployment rate is (10-3)/(100-3)=7/97=7.2%. This represents a 2.8% improvement, although the labor market condition has not improved at all. Is this what’s happening now in the US? If so, it will show up in labor participation rate, which is defined as the ratio between total labor force and adult population. And let’s assume the adult population is 150. 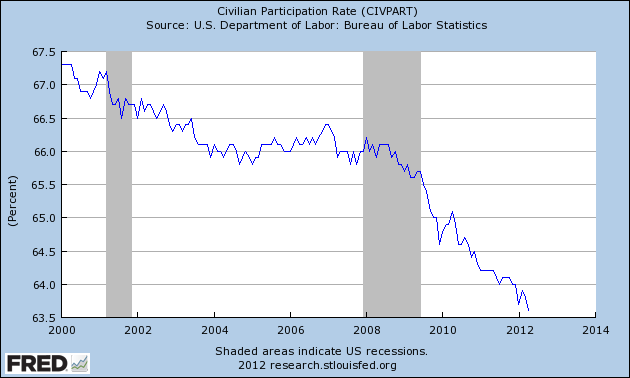 When there are discouraged workers giving up and exiting the labor market, labor participation rate drops from 100/150=67% to 97/150=65%. This is a post following my previous posts on the same topic, see p1, p2, p3. When discussing the issue, most people focus on GDP growth. 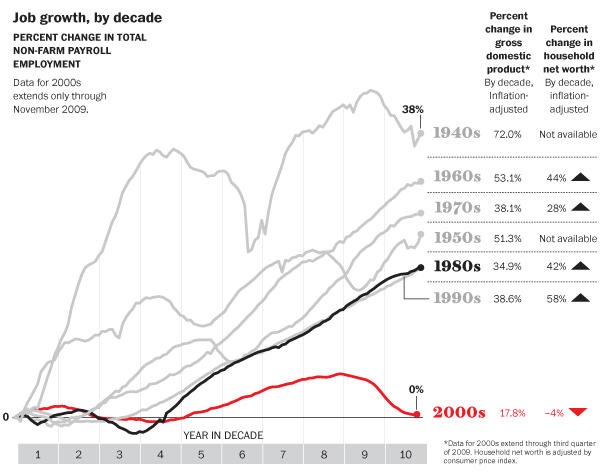 Yes, in terms of GDP growth, in the past decade, the US still managed to grow 18%, cumulatively – that’s roughly 1.8 percent per year on average. However, in terms of employment growth, it has been a lost decade for the US (see the chart below). 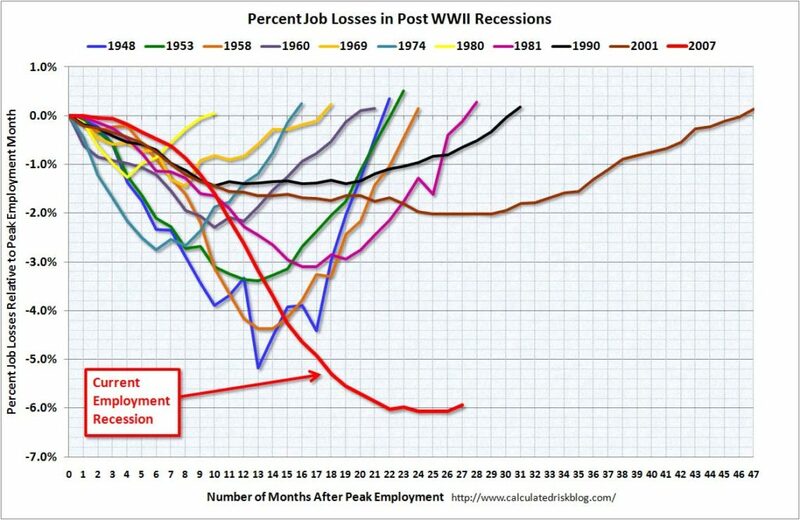 Given the economic dynamism in the US, and compare it to Japan, I have long thought the Lost Decade would never happen in America, a land full of opportunities. 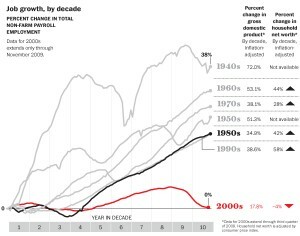 I guess I need to re-visit my presumptions — Whether a big housing bubble (in the US’ case, two big bubbles in one decade) always foretells anemic economic growth afterward, as opposed to the common belief that Japan’s lost decade was largely due to policy mistakes. Maybe, in the aftermath of a big bubble, America and Japan are really not that much different – an open question. Paul Kasriel, Chief economist of Northern Trust, explains in this interview piece why labor market will take very long time to recover. Very sensible analysis. 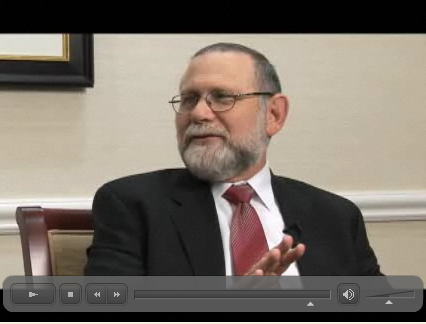 Also watch Part II of the interview. 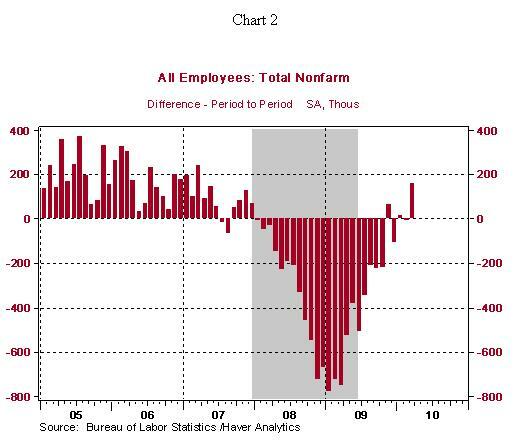 US labor market has started to add jobs at a pace not seen since 2007 (see chart below, graph courtesy of Northern Trust). This is positive. 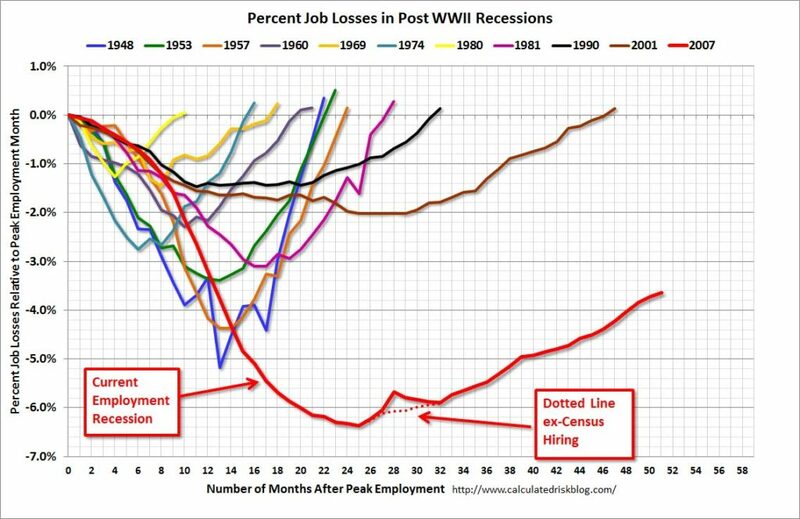 But still (pretty much) this will be a jobless recovery (see the scary chart below), following the last two recessions (1990-91, and 2001).